The Majestic Theatre to present Arsenic & Old Lace on January 29, 30 & 31! This classic comedy written by Joseph Kesselring in the 1930’s has been delighting audiences for over 75 years! In Arsenic, one of the American theatre’s funniest comedies, Drama critic Mortimer Brewster is engaged to the lovely Elaine Harper… but will she fit in with his ‘unusual’ family? Abby and Martha Brewster are known throughout Brooklyn for their many acts of kindness and charity. But Mortimer has just learned that his charming spinster aunts have taken to relieving the loneliness of old men by inviting them in for a nice glass of home-made elderberry wine laced with arsenic, strychnine, and “just a pinch” of cyanide! What else can go wrong? Their brother believes that he’s Teddy Roosevelt! Majestic Theatre is thrilled to bring Arsenic & Old Lace to life. Majestic’s Arsenic & Old Lace is directed by Amanda Pawlik. Amanda brings a wealth experience as an actor, director and instructor of theatre education. In fact Amanda started off with The Majestic as a teen actress herself starring in her first lead role in Majestic’s Graceland Asleep at the Wheel back in 2002. Amanda is a passionate educator of all ages, a proud member of DirectorsLab Chicago and an alumna of the O’Neill National Theater Institute. She has recently returned to NH after managing the Winsor Art Center in CT. “We’re delighted to have Amanda back at The Majestic for this production” said A. Robert Dionne, Majestic’s Artistic Director. “We have had kids grow up through our programs and return to act and direct as adults and it’s one of the most rewarding things we witness here at The Majestic”. The current cast of Arsenic & Old Lace is comprised of 12 young men and women ranging in ages from 13 – 20 years. Three performances will be held at the historic Derry Opera House located at 29 West Broadway in Downtown Derry. The Majestic started performing its youth and teen productions at The Derry Opera House in 2013. This venue of approximately 320 seats provides an intimate setting to see a play or musical. 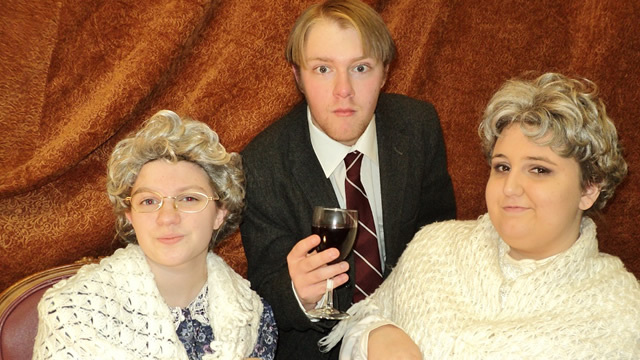 Tickets for Aresnic & Old Lace #dontdrinkthewine, as well as other upcoming productions can be purchased by calling The Majestic Box Office at 603-669-7469 or visit www.majestictheatre.net. The Majestic also provides dinner theatre presentations, educational programs, lessons under the Ted Herbert Music School and summer youth programs. VisitTheDeals Specializing in deals and coupons that families would enjoy! Operated by Charmingfare Farm, Inc. Copyright ©2019 VisitTheDeals.com. All rights reserved.